An essay competition is being held to mark 100 years of the infamous Balfour Declaration that changed the destiny of the Palestinian people, the region and the world, it was announced this week. The competition is being held by the Sri Lanka Palestine Solidarity Committee and the Embassy of Palestine in Sri Lanka. 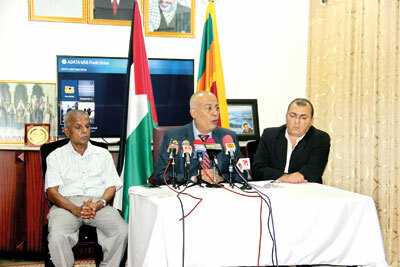 Ambassador Zuhair Mohammad Hamdallah Zaid flanked by his deputy Hesham Abu Taha (right) and Palestine Solidarity Movement member Mahinda Hattaka during Tuesday’s media conference. Addressing a news conference on Tuesday to announce the essay competition, Palestinian Ambassador Zuhair Mohammad Hamdallah Zaid said the Balfour Declaration made by Britain 100 years ago was the core of the Middle Eastern crisis and Britain should apologise to the Palestinians for the suffering they have been undergoing for the past one hundred years. The ambassador charged that the United Kingdom provided tactical support for the Zionist movement, facilitating European Jewish immigration to Palestine and land confiscation. He said the pledge the then British Foreign Secretary Arthur James Balfour gave Lord Rothschild, a Zionist leader in the form of a declaration that led to the many atrocities including ethnic cleansing of the Palestinians from their villages and massacres such as Deir Yassin, Qibya, Lod and Kafr Qassim. Palestine Solidarity Movement member Mahinda Hattaka and Mohammed Rihan also spoke about the injustice stemming from the infamous declaration. The topic of the essay is: The Balfour Declaration 100 years on: The quest for Justice in Palestine”.The essays could be written in Sinhala, Tamil or English. Its adverse impact on the Palestinian people, the region and the world, especially from humanitarian, security and international law perspectives. Should Britain be held accountable for the Palestinian suffering, and Your opinion on the declaration and the path ahead for the Palestinians to achieve peace with justice. The essays will be assessed by three panels. Please add footnotes and endnotes to support your claims. The winners in each language stream will receive cash prizes. The first prize will be Rs. 60,000, the second Rs.40,000 and the third Rs. 20,000. Please mail your essays in PDF format before October 1, 2017 to: balfour100years@gmail.com or send them by post to: The Embassy of Palestine, 110/10, Wijerama Mawatha, Colombo 7.